Halloween is the festival which makes one of the best holidays. It’s creative ideas help to make a blast. It has become more of a popular trend since its inception. Yes, it has its own range of them for costumes, decorations etc. celebrated on 31st October, it remains as one of the most awaited events of the year. It is related to life in haunted houses, reading scary stories, ghost tours, watching horror movies and spreading the love. To help you with the last, here are some DIY Halloween Decorations ideas that will make you stand out. These ideas are carefully handpicked on their convenience for making and affordability. Yes, these go easy on you while making a bold statement on your behalf. These ideas will be a landmark for creating more of sincerity and truth of evil. These DIY Halloween Decorations ideas will center your party which will allow you opportunities to surprise and scare your guests. These ideas are going out of the ordinary and bring a lot to the table beside black and orange. Yes, these ideas are all about remaining tactic in your approach to scare some of your guests, while spending the whole weekend working on them. Apart from the Pumpkins and scarecrow, indulge your guests with some of the boldest and scary fun pranks with these DIY Halloween Decorations ideas. What these ideas will make sure your festival is scary, fun, enjoyable and a memory to cherish for the year. Moreover, these ideas will make you go out of the way of ordinary and do something new in your approach. While at it, you can add your own personal touch and own every one of these. So whatever you got planned, candle holders or bat mobiles, make sure they are extra scary with these DIY Halloween Decorations ideas. 5 DIY Halloween Skull Decorations with plastic skull as main material. Planter skull – Part of the head is cut to create a hollow then filled with soil for succulent plants. Sugar skull vase – Cut part has no soil, instead a stem of flowers is placed on the hollow. Coachella skull – Without the cut, the head is surrounded with a headgear flowers. Skull candle holder – A candle holder is glued on top. Tattoo skull – Images of butterfly are glued all over the skull. Floating candles for the ceiling of a venue, beautifully installed in lieu of chandeliers. The candles are made of toilet paper rolls, painted white with the candles looking realistically drippy. The lights come from installed LED lights. The mood is dark and magical that reminds you of a part of the Harry Potter movie, Order of the Phoenix. A wreath is not only specific to Christmas. Here is a different version, a Spooky Eyeball Wreath for your door as Halloween wreath decoration. Spooky eyeballs are glued or attached all around a grapevine wreath which had been painted black. The googly bloodshot eyeballs create a unique scary atmosphere for all the kids roaming around for their tricks or treats. Halloween pillowcase chair cover is in a jack-o-lantern theme. Orange or orange-dyed cotton fabric, the color of pumpkin is used as the base of the cover. The cover fits well on the back of the chair. Black fabric is cut out into two big triangles for the eyes, a smaller triangle for the nose and a mouth. The cut outs are glued creating the face of jack-o-lantern. A strip of black cloth is attached on top to form the pumpkin’s stem. Decorative black bow on top completes the project. Pumpkin floral arrangement is for the Halloween dining table. The pumpkin size is in proportion to the size of the table. The top of the pumpkin is trimmed, all the flesh and seeds inside taken out and replaced by a water-soaked oasis. Different flowers in different lengths are arranged in the oasis. There are decorative twigs. A hand-made bow tied by a wire and inserted on the oasis completes this pumpkin centerpiece. Set-up on a corner of the house are lighted Origami Halloween Lights hanging on a twig that is nestled in a clear bottle, half-filled with white fine sand. The origami jack-o-lanterns and ghost lanterns are made of orange papers and white papers, folded into balls. Eyes, nose and mouth are drawn in black pen on a side of the paper ball lantern. The opening of the ball is on top where the Christmas lights are inserted. Turn on the light and there goes your twinkling Halloween corner accent. Monster cups for the Halloween decorations are good projects to preoccupy the kids. Transparent plastic cups are painted and turned them into monsters like ghost, spider, Frankenstein and pumpkin. Cups were painted in white, gray, green and orange representing each of the monsters. Glued to each cup are goobly eyes and the nose and mouth are drawn. Green spiraled wire is attached as handle of the pumpkin and black pipe cleaners form the legs of the spider. Puppy Paint Pumpkins are not only for Halloween; they can be great decorations for other seasons too. Pumpkins that are dark in color are painted white then with the use of dimensional paint, free designs are painted all over the pumpkin. Other colors are used and with the light skinned pumpkin, there is no need for color, just the use of dimensional paint for the design. Pumpkins are in different sizes for variety of design. The Heart Pumpkin has a cut-out heart attached on one side. The stem is painted with shimmering gold or silver. Striped ribbons are glued all around the pumpkin at uniform distance between each. A gold or silver (depending on the color of stem) heart is cut out then attached on the center of one side of the pumpkin. Smaller or bigger versions are made; the pumpkins group together to form a decor. Halloween treats in bat candy containers are great handouts to kids coming for tricks or treats. The candy containers make use of black pillow boxes. Bat wings made of black cardboards are attached to each side of the box. Goobly eyes are attached to the front and formed the bat’s eyes. The pillow box is filled with candies for the kids; then closed to secure the contents. Several Treat Buckets group together can be an adornment for the Halloween Day table. Change the colors for festive red and green colors to make it for Christmas. Polka dots are glued to small peat pots. The black frills are attached all around inside the lid. Insert black ribbon on opposite sides to form the handle. The pot’s lip is wrapped around by black and white twine. A small chalkboard attacked to the twine forms as the bucket tag. The pot is filled with candies and goodies. The Skull String Art is good to place on top of the piano, China cabinet, desk or just on a wall. The frame is made of a rectangular wood painted in black. The skull, as well as the eyes, nose and mouth are defined and outlined by a series of small nails. Then white string is hooked on the nails in a zig-zagging or criss-crossing pattern to cover the whole skull leaving the eyes, nose and mouth parts. A full grown huge tree in your yard and garden can mimic this design of Spooky Eyes on Tree. The eyes are made from two big white beach balls, about 24 inches in diameter. On the center of each ball, the iris is drawn in black paint or waterproof marker. The eyes are attached high on the tree using sturdy rope. You have eyes looking at all people passing by. Ghostly Ceiling Decors are very great to put outdoors, in the patio or veranda or perhaps in the carport. White water balloons are used and filled with water. It has a glow stick that creates the illumination. The water-filled balloons are placed inside white stockings that are attached to the ceiling and suspended in the air in unequal heights. Hanging Halloween ghosts decorations are three styrofoam balls of graduated sizes; they form the family of Father, Mother and Baby ghosts. Eye nail is inserted on each ball and this is where the string to suspend the head is tied. Eyes are painted in black. A piece of square cheese cloth, cut and tattered, covers the head. Three are made to form the family of Hanging Ghosts. 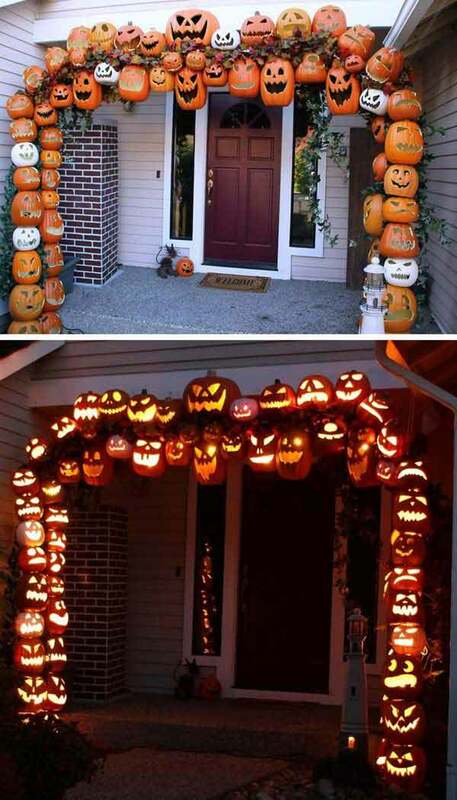 The Halloween pumpkin arch made use of lots of jack-o-lanterns in various sizes and various faces. The pumpkins are foam type, hollow and are carved to make a variation in the faces. Some white are inserted to break the orange monotony. The pumpkins are tied and arranged on rebar and PVC arch measuring 8 feet high and 10 feet wide. Lights were installed for nightly illumination. A very huge pumpkin is on the dining table. This is not the attraction but the enormous number of flying Halloween bats attacking the pumpkin. A template of bats is made and this serves as the pattern for the hundreds of cut-out bats. The material for the bats is black card stock or construction paper. Bats are attached with the use of double stick tape or duct tape. Spirit Jugs entail collection of many empty milk jugs. On one side of the jug, the face of the spirit is drawn using black mark pen. Different faces of spirits are done. A small hole was made at the other side of the jug, opposite the face. Christmas lights are inserted in the hole for the spirit to glow when the lights are turned on. The jugs are lined along the pathway or porch. Black birds are outdoors. Twigs are aligned at the left and right sides of the stair’s step. Seated on the twigs are black birds positioned to greet the coming kids. On the base of each twig is a group of three pumpkins. The height of the twig almost reaches the ceiling. Some birds are on the floor, some stepping on the pumpkins. The daughter of the homeowner at the door is dressed as a witch. Magnetic spiders nicely adorn a white metal door. The attached spiders are plastic spider rings that can be found in dollar shops. The rings are cut off and replaced with magnets using hot glue. If your front door is not metal, then you can attach your magnetic spiders to your fridge door or any other metal door. Place an orange wreath to conform to Halloween color theme. Before we share 4 Tips for how to make Halloween decorations with spider & web inside & outside of home to spook up everyone. Pretty pumpkin vase painted in pink placed on a round wood cake holder is a nice idea for your center table. Paint the well-proportioned pumpkin pink with an assortment of artificial roses and other flowers; the pumpkin serves as a vase. Want it to be more of a Halloween theme? Then, pick orange flowers with some black flowers. You can opt to paint your pumpkin in any color and still stick to your holiday theme. The huge Halloween spider web turns a white wall into a spooky area. Cut out double adhesive tapes are attached to the wall and the white yarn to form the web passes through the attached tapes. Circles were created, from the center rise the straight parts of the web, then the draping parts. A huge spider is pinned in the center with three crawling small spiders. On the side table is skull and down the floor are timber logs. Your Spooky Door Greeter is a frightening eerie ghost, the height of a tall person. The ghost is made of cheese cloth proportioned for the size of the human figure. Cut, shredded and tattered, the bottom of the ghost flows, especially when the wind blows. Glow sticks are at the back; this will create a frightening mood at night. Lighted jack-o-lanterns along the way add to the eerie atmosphere. Do you want something spooky or something with a subtle look Halloween Front Porch Decorations. Falling up the Stairs are lots of black mice that are cut out using mouse templates on black construction board. Such mice are also available in some craft shops. On the side of each step of the staircase are groups of pumpkins that are either waxed or painted in orange. Some are left in their natural color. Added are LED votive candles that glow. Paper bats on the lampshade for an eerie ambiance when the lampshade’s light is turned on. Templates of flying bats in different sizes were made then traced and cut on black cardstock. The bats are taped inside the shade. The right or left wing is flipped to make the bats look as if they are flying in the flipped directions. The silhouette of the bats only comes out when the lampshade is turned on making the eerie atmosphere evidenced at night only. Glowing wispy ghosts are nice to place on top of cabinets or line them in a horizontal shelf. The tiny ghosts are made of plastered white cloth. The shape was achieved when the plaster was dried through the use of a disposable armature. Black eyes were cut and attached to the ghost’s head. LED tea candles were placed underneath to create the lighted glowing look of the ghosts. The upcycled Halloween wreath looks more like a giant spider web on the front door. The long sticks are glued together forming the circular base of the web. T-shirt yarn is worked over-under-over the stick to form the web. At the end of the outermost part of the web, a piece of yarn is left dangling. A faux spider is attached to the edge and left dangling too. Bloody pillar candle is one of the easiest to do but is amazing once placed on the table or cabinet top. Put a big white candle on a black candle holder. Light a red candle and let the melting wax drip over the top down to the sides of the white candle. Make it more spooky-looking by replacing the white candle with a black one. This is one instant decoration for Halloween day. Halloween tin can luminaries are made with empty tin cans. Words or figures are drawn on the can then poked to create holes representing the drawn letters or figures. The tin can is painted with black acrylics. On the center, inside the tin can, candle is installed to serve as the luminary. Light the candle. This decoration is suitable to place along the walkways or even scattered around the garden but ensure to put the candles off when no one is around. Here is a family of black cat o’lanterns made from different shapes and sizes of pumpkins for the head, body and paws. Bended cucumbers are used for the tails. All pumpkins are painted glossy black. The pointed ears are cut from stiff felt paper and the eyes are carved. On the body or base, place a tea light which when lighted will create an orange glow of the eyes. This is a good substitute for jack-o-lanterns on the stairway. Best Halloween glass jar lights made of Mason jars become luminaries with little creativity. Jars are either painted in acrylic or colored tissue papers are glued to the transparent jars. Then the faces of Frankenstein, ghosts, jack-o-lantern, witch or spooky birds, spiders, mice are drawn on the bottle. LED tea lights are installed inside every jar such that when turned on, you will have glowing Halloween decorative jars. The scary floating ghost is on your China cabinet or bookshelf. This one is made from white cheese cloth that had been made stiff when sprayed with starch. The shape or support is made with a ball, bottle and wire for the head, height and arms. When the starch dries, the support is removed to leave the ghost standing with stretched arms. Two round black felts eyes are glued on the head. Floating witch hat luminaries are easy-to-make decorations provided you are able to locate witch hats. These hat types are available when Halloween nears. A fishing cord passes through the tip of the hat. One end, inside the hat, is for the LED light bulb and the other end is tied to a nail or screw on the ceiling. You can adjust the height of your luminaries. Spooky Halloween candle light cups are among the easiest and least expensive luminaries for this holiday. You need colored plastic cups: green for Frankenstein, orange for jack-o-lantern and white for ghost. Turn the cups upside down and draw the faces with a black marker. Place LED tea lights under each cup. These can be a decoration in any place of the house, tables, stairways or shelves. The materials for paper bag lights can be a choice from the brown or white paper bags, the size of which goes proportionate to where they are placed. Holes to form words can be punched or stencils can be made and cut-out for the desired design. Fine sand are placed inside to hold the bags upright. LED tea light candles are placed on the sand. Paper bag lights can be situated on the walkway, stairway, table, or anywhere you want them. Different four front door Halloween decorations are turned into faces with googly eyes; mouths are designed in a variety of ways. Cut-out strips of cloth or fabric of varying colors form the hair and the mouths are strips of white tapes. In one design, the door is partially covered showing big mouth with protruding teeth. Spider webs and spider are added for spooky appearance. The Halloween cheesecloth ghosts are formed through the use of a balloon and inverted plastic cup mold. Cheesecloth is soaked in fabric stiffener then immediately draped over the mold. When the cheesecloth dries, black round felt eyes are glued to the head. The balloon is deflated and fishing line is threaded through the head for hanging the stiffened ghosts. It’s time that you do something about your windows decorations. Bloody hands on the windows will frighten trick or treaters. The fake blood is red dye which is a mixture of a drop of blue dye and several drops of red. White glue formed through the hand and applied on the windows serves as the base for the handprint. The base is dried. Red dye is applied on a gloved hand which in turn is pressed on the dried craft glue. Some drops of red dye are left to create dripping bloods. A floating cheesecloth ghost requires a mold constructed from balloon or ball of desired size placed on a stand of desired height. Cheesecloth stiffener is made by mixing water and cornstarch that is heated in a microwave. Cheesecloth is coated well with the cornstarch mixture then draped on the stand until it dries. Arrange the cheesecloth in the desired ghost appearance. When completely dry and hard, remove from stand then glue the round black felt eyes. Add red bows on the head for female ghosts. Hanging foam bats on the tree at the front fence create spooktacular surprise to trick or treat setting kids. Needed for the weatherproof hanging bats is black craft foam on which to trace the flying bat template. After making the cut-out foam bats, a hole is punched at the end of the bat’s body then glue googly eyes. With a fishing line tied on the hole, the bats are suspended on branches of the tree. Make a colony and frighten or amuse the passersby. Egg cartoon bats and leaf ghosts are great to hang in chandeliers. The Halloween egg bats are made of three sections of empty egg cartons; the middle is the bat’s body and the other two scalloped parts are the wings. Painted black, googly eyes glued, orange polka dot ribbon is attached to head for hanging purpose. The leaf ghost is made from a hand-shaped plastic leaf, painted white and when dried, the ghostly eyes and mouth are drawn in black marker. Black polka dot ribbon is glued for hanging. 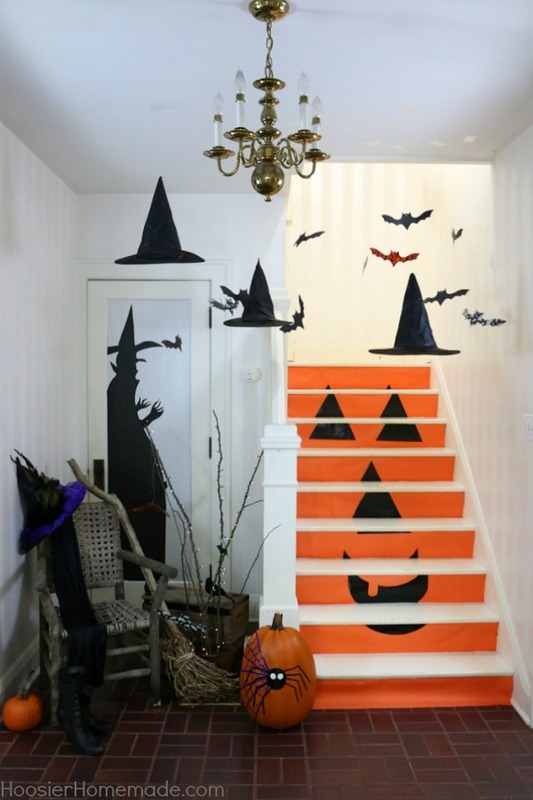 This stair decoration is easy but the complexity lies on the many things to prepare though jack-o-lantern is still the focus. Strips of orange paper with black face of jack-o-lantern are installed on the white stairway. Witch hats and bats made of black craft paper were hanged. A silhouette of a witch is made from black craft paper or board then attached to the white wall. A huge pumpkin with spider and web on the foot of the stair, twigs, witch broom and worn-out chair complete the eerie and spooky corner. Three-dimensional giant spider web looks more awesome than one web installed flat on the wall. Even the color of the web was altered, a purple yarn! Choose your color. The arm of the web is first installed on the wall and China cabinet’s edge then the circles are created by looping the yarn on every arm. Place plastic store-bought spiders on the web. Add some cut-out bats behind the web, not so spooky but Halloween themed. Giant spider at the lawn is made from two stuffed black plastic garbage bags, a bigger one for the body and the smaller version for the head. Creating the legs is the challenge; use PVC pipes, paint them black then attach to the body. Arrange the pipes into desired leg position. It must appear crawling on the ground. The eyes are red stick-on reflectors. The web is made of poly ropes set up haphazardly to look like a web made by the giant spider. Hanging ghosts on the ceiling are easy to create. Foam balls for the head are wrapped with thin lace or cheesecloth. Gather the cloth on the base of the ball, tie and let the rest of the cloth hang as floating bodies. A string is sewn on the top of the ball for hanging. Pins with black heads are inserted on the ball for the tiny eyes. Glowing eyes are cuts from empty toilet paper rolls or paper towel rolls. You can also roll cartons into tubes. Cut out different spooky eyes on the rolls. Insert different colors of glow-in-the-dark sticks. Cover the rolls’ ends to secure the glow sticks. Hide these in the outdoors or dark places. When the light glows, you have spooky eyes in the dark. Doormat Halloween decoration at the doorstep can be an old doormat, still good and tidy. Or you can by a cheap one. Make templates of the letters B, O, and another O on a piece of cardboard or paper. Using the templates, begin painting the letters in black. You need several layers of paint. Let the paint dry and add a crawling plastic snake anywhere on the mat. Steampunk Halloween decorations near to fireplace & mantel is a spooky but overwhelming project, a science-fiction atmosphere yet with the American Wild Wild West ambiance. You create your steampunk spider, steampunk skull with the metallic hat and the challenging steampunk Halloween mantle. With a gold painted PVC pipe, the “Happy Halloween” greeting is created. There is the skeleton sitting on a chair with LED candles at its foot. You can add any other antiquated items that have the color of gold and black. BOO sign at front door is simple but fantastic welcome greeting to Halloween guests. Getting hold of the right size of wooden letters B, O and O, you paint them black. With glossy or shimmering tulle ribbon, tie the letters, BOO spelled downwards. Make a huge bow from the tulle ribbon and attach it decoratively at the top of letter B. Hang it in the door wreath hanger. Halloween jack-o-lantern topiary at your door, lighted at night, is decoration to choose for the season. This topiary is made of lighted pumpkins in different facial expressions, three are painted white and two are black, arranged alternately on a black dowel. The topiary’s dowel is placed in the middle of a huge soil-filled pot. Lights threaded from top to bottom then lighted at night. Halloween witches cauldron made use of two plastic cauldrons, both painted black. The first cauldron is placed upside down on the floor then the second is on top in the right upward position. Bend a pool noodle in half for the witch legs. Place the stripped tights on each stuffed leg then put on the witch shoes. Bended portion is installed inside the top cauldron ensuring that there is sufficient pillow stuffing to hold the inverted witch legs.